Home > Shop By Brand > BLACKFIRE Pro Detailers Choice Car Care Products > BLACKFIRE SiO2 Spray Sealant 128 oz. As the technology that goes into automotive detailing products continues to advance, the quality of results and the capabilities of the products likewise continue to advance. The things that are possible in the detailing industry today would leave the professionals of car detailing's past flabbergasted. The advancements of protection products in particular are exceptional when you compare modern protection products to classic waxes that used to be popular. BLACKFIRE SiO2 Spray Sealant marks another great advancement in the evolution of protection products. BLACKFIRE SiO2 Spray Sealant allows you to achieve the amazing protection that a standard synthetic sealant would provide with a convenient “spray-on, wipe-off” application process! BLACKFIRE SiO2 Spray Sealant is very easy to use! Simply spray onto clean and dry paint, and buff off for a sleek shine and protected finish. Your paint is under constant assault of extremely dangerous hazards and contaminants that threaten to dull, discolor, and scratch your precious painted surfaces. Being able to adequately stand up to this endless bombardment of hazards is quite a difficult task and formulating product that is up to said task is just as difficult. The chemists at BLACKFIRE have done just that with their BLACKFIRE SiO2 Spray Sealant. You will be able to live unhindered by constant worry for your paint's well-being when you use BLACKFIRE SiO2 Spray Sealant on your paint. BLACKFIRE SiO2 Spray Sealant's ability to effectively protect your paint from road film, industrial fallout, dirt, and many other contaminants is comparable to other standard synthetic sealants that can take up to 4 TIMES longer to apply. BLACKFIRE SiO2 Spray Sealant can be used as a stand-alone protection product, or as a "booster" for your already coated paint! 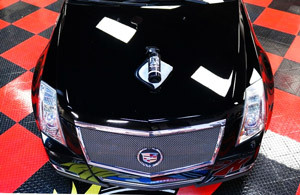 Just check out the depth and gloss created on this 2010 Black Cadillac CTS! 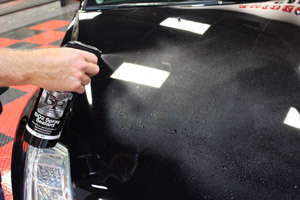 - Use BLACKFIRE SiO2 Spray Sealant on freshly washed and dried paint. - Shake the product well and spray directly onto a clean and soft microfiber towel. - You may also spray directly onto the paint, being cautious of overspray. Apply to the surface using an even, back and forth motion. 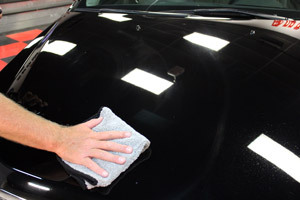 Using a second clean microfiber towel, buff away the hazed over residue. I've been pleased with the Blackfire SI02. The shine holds up and it repels dirt well.Best of all it goes on easy. Si02 is the easiest product to apply and the shine and durability is second to none. I love this stuff. Put It over a coat of Klasse aio for an awesome shine.